Los Angeles Lakers have been going through some changes recently as the team is still getting used to the new coach, Mike D’Antoni. With just a week of practice with the team, it looked like the new offensive style was really paying off as the Lakers got their highest scores in the last two games. However, the game against Brooklyn Nets showed a different team and it is safe to say that their defense was the thing that got them the win towards the finish with a final score of 95-90. Stay up to date with more sports news and always know what is happening across the globe. 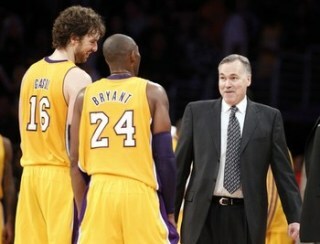 Mike D’Antoni was hired by the Lakers last week after he had gone through surgery to replace his knee. The first week focused more on introducing the team to a more offensive style which worked out very well for the Lakers in the past two games. On Tuesday, it was the first game in which the coach was on the sidelines directing his team towards victory although he is still recovering from the surgery. Towards the end of the match, the Lakers pulled off an amazing defense to secure their win on home field. Kobe Bryant finished the game with 25 points after getting eight in the final minutes while the Nets were held under control, not getting anything on the scoreboard. This three minute stretch showed perfect defense and got the hosts their third straight victory. The new coach is aware of the fact that it is quite easy to lead a team such as the Lakers to victory, especially with Kobe Bryant in full shape. He declared that there is no reason to lose with such a team and that they plan on winning every game they play. During the few times he left his chair in the first half, D’Antoni showed that he isn’t at his full strength but got back to his regular ways after halftime. He was protesting calls in his usual theatrical manner despite walking with a limp. Brooklyn Nets showed great performance during their last few games but weren’t able to hold on by the end of the game and find the much needed openings in Lakers’ defense. They were leading by six points by the mid of the fourth quarter but lost their momentum. Deron Williams missed a three-pointer with just four seconds on the clock that had the potential to tie the score. However, he had a very good game with 22 points in total and 10 assists and Brook Lopez scored another 23. If the Nets would have won this game against the Lakers, they would have matched the best start in franchise history in a campaign since the season in 2002-2003. It has been a great season for the Nets since they moved to Brooklyn from New Jersey. Their defense was impeccable with an average of 92.5 points making it through per game under the supervision of coach Avery Johnson. The Los Angeles Lakers started the game determined to take the win, quickly getting up to ten points while the coach watched in his debut game on the sidelines. However, they weren’t able to maintain their good start as the Nets got the lead by one point before halftime; 57-56. The score was 86-84 for Brooklyn with just 3 minutes and 23 seconds to go. Bryant secured the win with six shots in a row from the free throw line. Dwight Howard had problems from the line and only made 7 out of 19. Brooklyn Nets are now 6-3 and in fourth position in the Eastern while Los Angeles Lakers are in sixth in the Western with 6-5. The Nets will be going up against Golden State Warriors on November 21 and would try to get a win on the road. The Lakers also have a game on November 21, against Sacramento Kings who are now 2-8 and in 5th position. Lakers are favored for this game and it is expected for them to take their fourth consecutive win and make the new coach even happier.